Home » Uncategorized » Read all about it! My last post was all about the Entrepreneur’s Convention and how motivated I was when I came back. Just to prove this was so I thought I would base this blog on my journey writing a newsletter for the first time, and what I got out of it. I gave myself four days to get it in the post, because I was due to go away for a long weekend with my mum for her birthday on the Thursday morning and I knew that if I waited until I came back momentum would be lost. I had no idea what tool to use as I didn’t have Microsoft Publisher as part of my Office package – and Publisher was the only tool I knew. After some research we found Swift Publisher 3. This tool was relatively inexpensive ($18 I think) but had the professional look I was after. Package bought and downloaded it was time to think of a theme and title. After much head scratching my hubby came up with a great title. 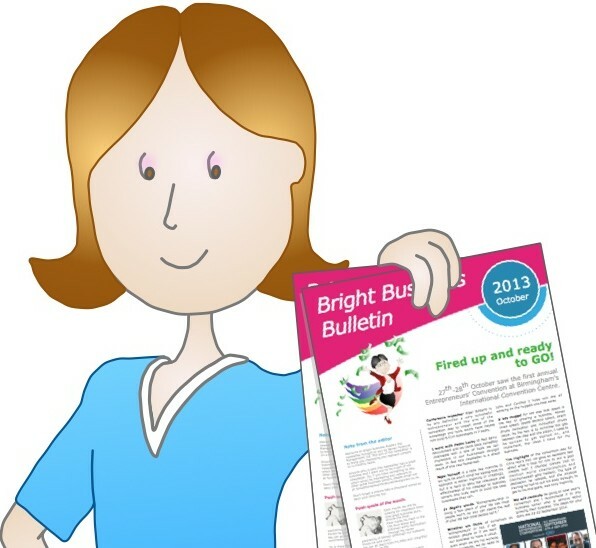 As my blog is Bright Business Thoughts how about Bright Business Bulletin? Perfect!! Then it was a case of using branding and pictures I already had on my website to give the right look and feel. Content was the next issue. As the newsletter is for clients and other good business contacts it is important to me that they get value from the newsletter. It is not to be about me but about other interesting businesses and with useful tips and advice. The Entrepreneur’s Convention was an ideal lead article as it was topical and of interest to an audience of entrepreneurs and business people. The rest of the newsletter was filled with regular features I plan to run each month: A quote from that great business guru Winnie the Pooh; a slot with our financial agony aunt Jenny; Michael’s minutes where Michael gives us a quick tip on time management; dates for your diary; and a community section featuring a great business; someone who has helped me in the month and a partner of the month (someone I recommend). I have had some good feedback so hopefully it is the right mix of content and entertainment. I met my ‘in the post’ target – just! By the end of Monday I had the newsletter at the printers, the envelopes ordered and the stamps bought. By the end of Tuesday I had the list of recipients prepared and labels printed. The envelopes arrived Wednesday pm so I was able to label and fill them before popping them in the post by 6pm Wednesday evening. So what did I learn? Firstly, you can achieve a lot when you give yourself a deadline – even if the tight schedule meant a typo missed editorship! Secondly, a good tool takes a lot of the stress away from doing a project. And thirdly, I am very lucky to have a husband who is very good at graphics and is happy to help! By Fiona Bevan in Uncategorized on October 15, 2013 .